ELO hosted the second SoSOL of the 2018 series at Binning Wood on Sunday 28th January. Leave the A1 at either Haddington (if coming from the west; take the second Haddington junction, known as “Abbotsview” and signed “Haddington/East Linton”) or Dunbar (if coming from the south) and then follow the A199 (“the old A1”) to its junction with the A198 signposted North Berwick. Follow the A198 for 2 straight kilometres to Tyninghame village. Turn left onto the B1407 and take the next right after 1 km onto the minor road signposted Newbyth and Lawhead. Go north for 2 km to the north-west corner of Binning Wood. Parking for cars will be along the side of this minor road as directed by marshalls. Larger vehicles will be asked to park at one of the two public parking areas on the west side of Binning Wood at 600m and 800m from assembly. There is no charge for parking. The NW carpark will not be used by competitors. It is reserved for visitors to the memorial wood and for members of the event team. On leaving it will reduce congestion if you continue N for 1km before turning right to Whitekirk village and then right onto A198 going S for 4km to A199 junction. Registration and Download are near the north-west entrance and open from 10:00 am to 12:00. Start times are from 10:30 to 12:30. If possible, please enter in advance at SI Entries. There will be entry on the day for which filling in this form will help. Registration / Download is 350 metres from Start, and 150 metres from Finish. We will not be allocating start times. Just join the queue for your course at Start. Members of the same club should not start the same course in consecutive slots. Courses close at 2:30 pm. Please report to the Download by 2:30 pm even if you have not completed your course. White and Yellow maps should be collected from Registration. Other maps (and loose descriptions) will be given out at the Start. Maps for all courses are 1:7500 with contours at 2.5m intervals. There will also be a free String course of approximately 400m for young juniors near Registration. This is not suitable for buggies or prams as the ground is boggy and/or uneven in places with scrubby undergrowth. Wellies recommended. Binning Wood was originally planted in the 1700s and was almost completely felled during the second world war to build Mosquito fighter-bombers. 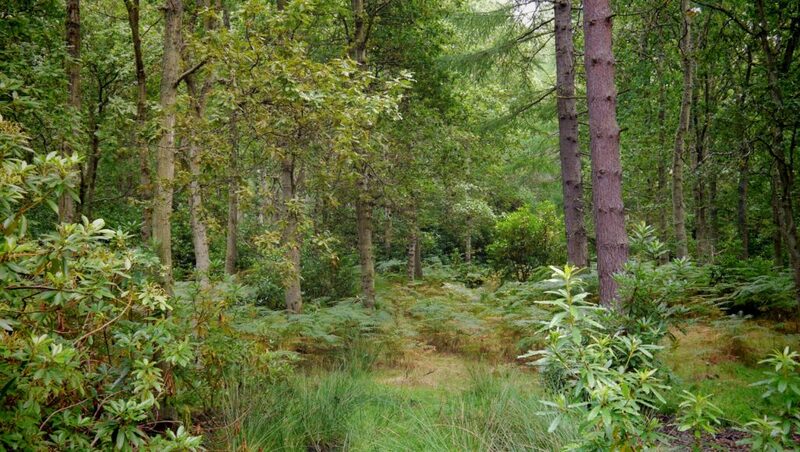 It was replanted with conifers and beech and has a complex network of rides, paths and ditches which can be disorientating to the unwary. Although much of the site had been overrun with rhododendron, work is ongoing to clear some of the site which has dramatically improved the runnability. In many areas visibility has improved and hidden ditches have reappeared, although the brashings, shown by green undergrowth screen, will slow you down. The map was updated for the Scottish Relay Championships in 2017 and shows the ride network radiating out from three large clearings along with an area at north of the map which is a green burial site – the Binning Memorial Wood. This area is marked on all maps as out of bounds to orienteers. Results will be published here after the event. There may be a local WiFi results service in the assembly area. If bad weather forces cancellation or postponement that will be notified here. If in doubt you should check this website before travelling. Toilets: There will be two Portaloos in the NW car park nearest to the registration/download area. A comprehensive risk assessment is carried out by the organiser but participants take part at their own risk and are responsible for their own safety during the event. Ticks are currently present and active in the wood. Wear appropriate clothing and check skin for ticks as soon as possible after the event. Note that the area is popular with dog walkers so please warn children that they are likely to come across dogs running loose. When entering our events your name and/or photograph may appear in the results section of this website or in newspaper reports. Please note that there is no Saturday afternoon ELO local event this month.